I was honored to be reappointed House Chairwoman of the Joint Committee on Education for the 2019-2020 session, and for the opportunity to continue working on legislation to improve education in Massachusetts. This session I have filed education bills that are focused on improving teacher preparation and certification, dropout prevention and re-engagement, special education finance, and high quality early education. In addition to these important policy efforts, the Education Committee will be working on a number of bills files to improve the mechanism by which public schools receive Chapter 70 funding. Massachusetts has the best public schools in the nation, but there is still work that needs to be done to ensure all students have the opportunity to succeed. I look forward to working with Governor Baker and my legislative colleagues on these and other issues over the next two years. In an effort to ensure that all students have access to effective educators, this bill establishes a master teacher corps program that creates incentives for highly effective educators to work in high-needs schools, and would recognize and reward those educators for their service. The bill would also require the Commissioner of Elementary and Secondary Education to regularly review educator preparation programs and annually publish data on such programs, including the approval status of said programs. The bill also directs the Department of Elementary and Secondary Education to convene a task force to study the feasibility of requiring all teacher candidates in education preparation programs to participate in a teacher residency program. While Massachusetts lays claim to the best public schools in the nation, the dropout rate continues to be a significant barrier to closing the achievement gap. This bill would help reduce the dropout rate by establishing a three-year pilot program focused on dropout prevention and re-engagement strategies in high schools with annual dropout rates greater than 4%. Such programs will utilize methods including alternative education, success mentors, outreach programs, and expectant and parenting student supports. 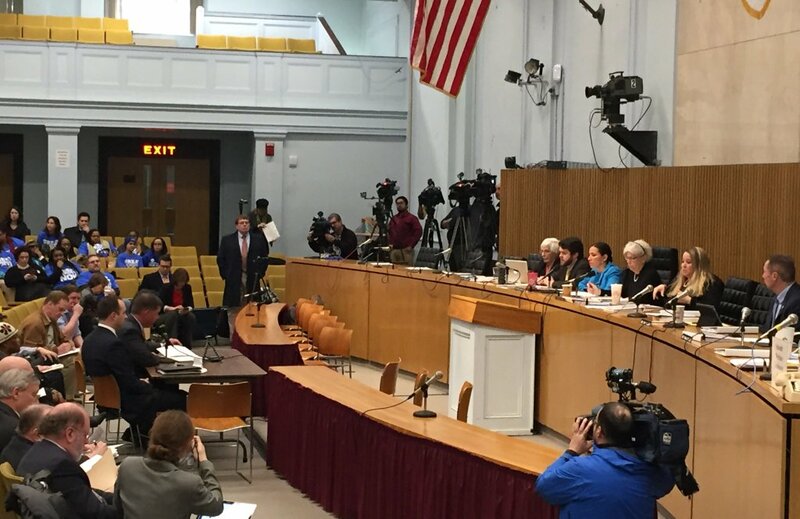 In an effort to ensure that student-athletes in Massachusetts property understand state laws prohibiting hazing, this bill would require that every student-athlete participate in a hazing training program prior to the start of their athletic season. The training program would help student athletes understand the types of activities considered hazing, the legal ramifications of hazing, and the potential negative impacts on all involved. Approved private special education schools, otherwise known as Chapter 766 schools, do not currently have school profiles and student achievement data readily available to the public. This bill requires the Board of Elementary and Secondary Education to annually publish a report containing student achievement data and establishes a commission to determine the role of Ch. 766 schools. In addition, this bill outlines the role and responsibilities of the operational services division, which annually determines the price for special education programs based on the enrollment of students, and requires Ch. 766 schools to annually file financial reports to the department of elementary and secondary education and the state auditor. With the goal of linking professional development and educational credentials to increased compensation and leadership opportunities in the field of early education and care, this bill directs the Department of Early Education and Care to develop a career ladder. Studies have shown that increasing access to high quality early education is one of the most effective tools for closing the achievement gap. This bill builds on the lessons and outcomes of the Federal Pre-School Expansion Grant program by establishing a statewide grant program through the Dept. of Early Education and Care that would support districts in developing high quality early education programs for children from birth through age five. This legislation is a re-file of a bill engrossed by the House during the 2017-2018 session in order to ensure high quality early education and care throughout the Commonwealth. The bill achieves this by directing the Dept. of Early Education and Care to develop a rate structure for providers and a sliding scale fee structure for participants, as well as a mental health consultation program and a scholarship program for early educations so they can obtain the training they need to provide high quality early education and care for our youngest students. Over 300 bills have been referred to the Education Committee this session. The Committee plans to hold hearings on these bills over the course of this year, during which the Committee will collect and review testimony and conduct research on each individual bill prior to taking action on them by next February.